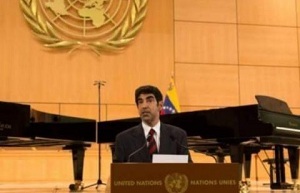 GENEVA, Jun 20 2018 - Dr. Hanif Hassan Al Qassim, Chairman of the Geneva Centre for Human Rights Advancement and Global Dialogue, has appealed to international decision-makers to express greater solidarity to destitute refugees from the Arab region and to work jointly to address the protracted refugee crisis. The Geneva Centre’s Chairman made this call to action on the occasion of the 2018 World Refugee Day which is observed annually on 20 June. Dr. Al Qassim highlighted that there are more than 5 million refugees in the Arab region owing to the proliferation of conflicts and the rise of violent extremism in Syria, Iraq, Libya and Yemen. The efforts of Jordan and Lebanon in hosting and in providing assistance to refugees – that may add up to 25% of their own nationals – stand out as shining examples of countries driven by the principles of international solidarity and justice, Dr. Al Qassim remarked. In relation to the situation in Europe, the Geneva Centre’s Chairman said the inflow of displaced people has been exploited by a populist tidal-wave fuelling xenophobia and in particular Islamophobia. Although the arrival of displaced people to Europe only add up to 0.2% of Europe’s population, human solidarity and justice are being frayed by the fear of the Other. The campaign of fear waged against migrants and refugees is bringing back the spectre of nationalism and chauvinism threatening international cooperation and peace over the long run, he observed. In conclusion, Dr. Al Qassim appealed to countries in the West and in the Middle East to step up their joint efforts to eliminate the root causes which have fuelled extremism. Peace and stability in the Middle East need to be restored before refugees can safely return to their home societies. This calls for a radical political change of approach in problem solving in the region. The world society must express greater solidarity for refugees worldwide, he highlighted. They’re not refugees – they are economic migrants. In England we cannot have severe sectarian Islamists or people who want to carry on ancient traditions of Pakistani villages.